Restaurant Style Pan Fried Garlic Pomfret Masala is a tasty preparation of pomfret fish. This is the dish I prepared last week and we all relished it with butter rice. 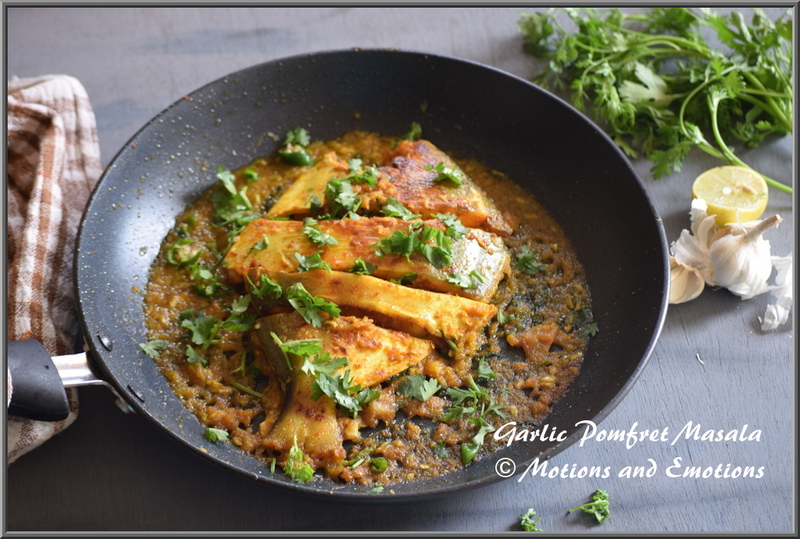 Restaurant Style Pan Fried Garlic Pomfret Masala is absolutely my recipe. Last week he went to fish market and while going he said I will bring prawn mostly. But when he returned he got a big size white pomfret and said today the vendor got good pomfrets so I changed my mind and got this. I was like (in my mind) good for me as I do not prefer prawns often. He said cook this pomfret in a delicious way. I said "What do you mean? Don't I cook the other dishes delicious"? He said 'No I meant cook a restaurant style dish'. Then I created this lip smacking Restaurant Style Pan Fried Garlic Pomfret Masala. I was in rewind mode and went back to my childhood memories just to recollect how my mother used to cook pomfret when we were kids. I could have called her but at times recollecting memories give a smile on your face and you remember those golden moments of life. Those days no cable TVs or apps or colourful magazines to check for recipes for a new ingredient. But I remember my mother never cooked pomfret similar to the any Bengali style fish preparation. She used to marinate with coriander leaves paste and a tangy lemon flavour. Aha! I was salivating and immediately back to the present state. I thought more than coriander my husband prefers garlic flavour and then the creation of Restaurant Style Pan Fried Garlic Pomfret Masala just happened. Weekend is here so if you are craving for fish you can buy pomfret and cook this Restaurant Style Pan Fried Garlic Pomfret Masala. 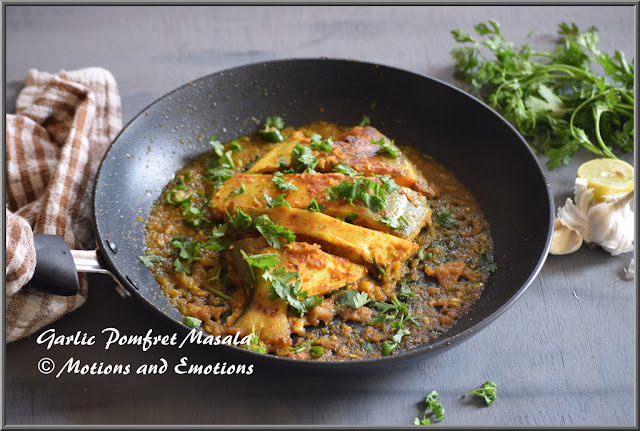 If you are not getting big pomfret you can do this recipe with small pomfret as well. Let's now learn how to cook Restaurant Style Pan Fried Garlic Pomfret Masala? 1. Clean the fish fillets or pieces and marinate with salt, turmeric powder, black pepper powder, 1 tablespoon of lemon juice, garlic paste and 1 tablespoon of oil for 30 minutes. 2. Heat oil in a non stick pan and fry the fish pieces under medium flame. 3. When both sides are done, take out the pieces and keep aside. 4. If you have excess oil in the pan then reduce it to 2 tablespoon. 5. Now add chopped garlic and onion and cook until the onions are translucent. 6. Next add the dry spices a pinch of turmeric powder, cumin powder, coriander powder, red chilli powder, chopped green chilli and salt to taste. 7. After mixing the masalas add 1/4 cup of water and add the fish pieces. 8. When the water is almost drying up add 1/2 tablespoon of lemon juice and give a good mix. 9. Switch off the gas and garnish with chopped coriander leaves and serve hot. I haven't had pomfret in ages! This looks so very flavoursome and appetizing! Its really nice infect its delicious and I hope I can c more of it.